A Crunchy, Chewy, Soft Lemon Meringue filled with Freshly Whipped Cream, Lemon Curd, Passion Fruit, and some Freeze Dried Raspberries to decorate. 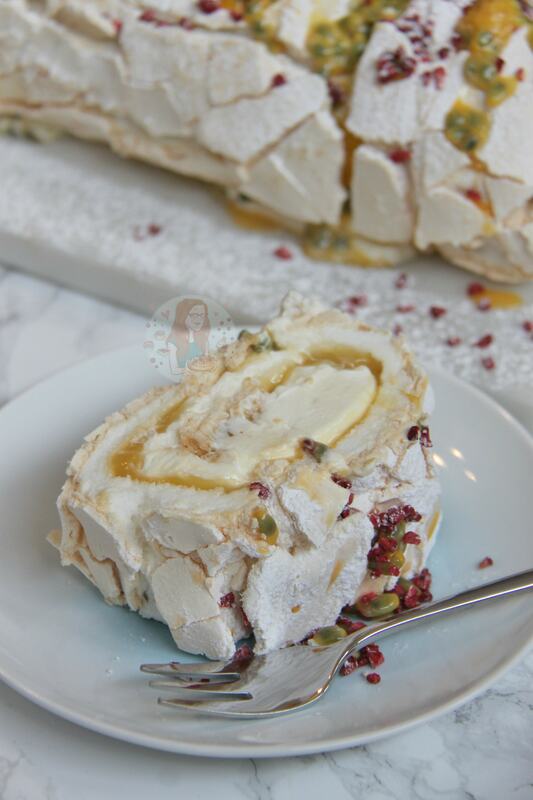 A Delicious Lemon Meringue Roulade! 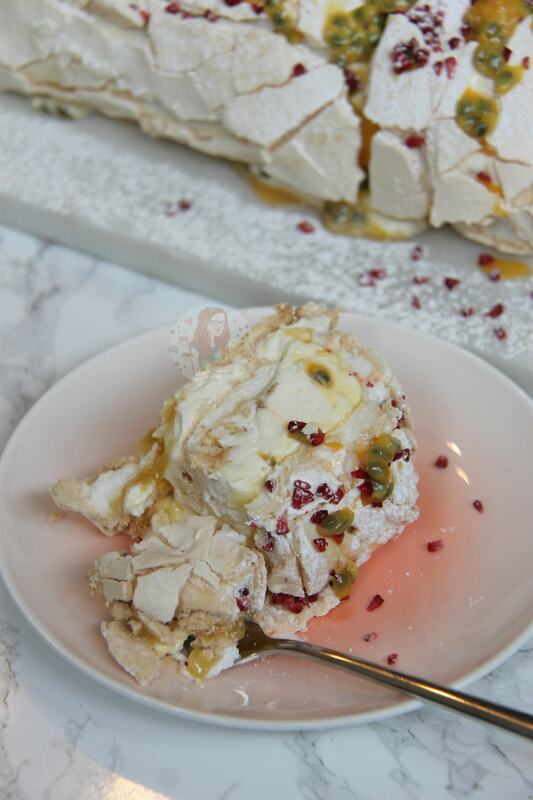 So last year I posted my recipe for a Spring Pavlova and it was a big hit. The mix of a soft and homemade meringue, topped with a silky sweet fresh cream, lemon curd, and passion fruit was a delicious combination. Honestly, I adore it. I love Pavlova and Meringues in general because they are just SO delicious and easy to make. Also, like my, Christmas Pavlova Wreath, they can look really very impressive on the dinner table. 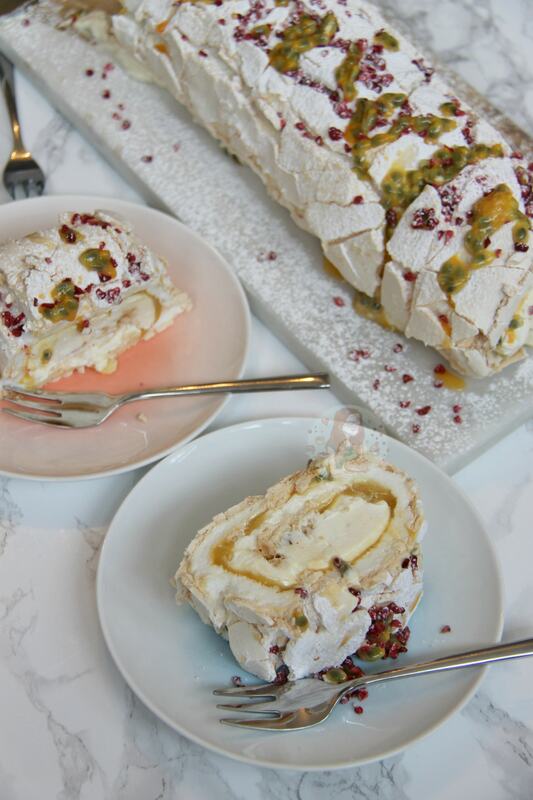 I always ask for suggestions of what recipes you would like to see on my blog, and one that has come in time and time again is a Meringue Roulade. Honestly, I didn’t really know if I would do it or not, but once I had eaten some of one, I knew I had to make one myself. 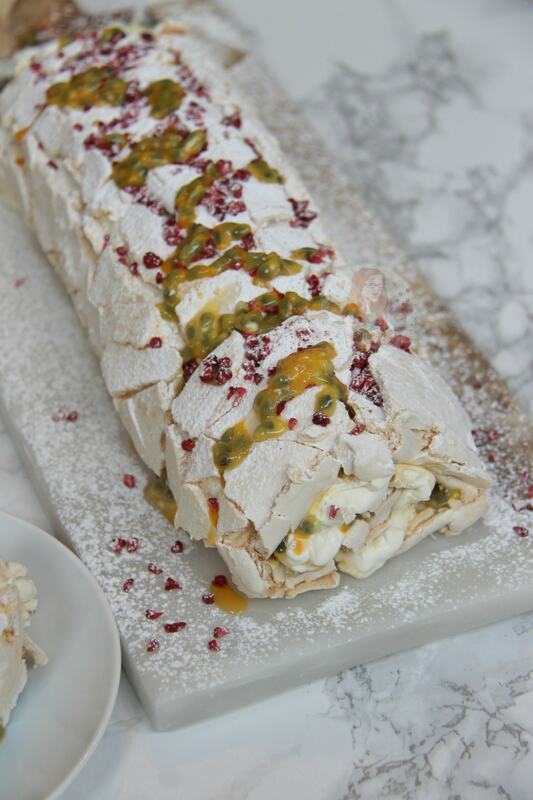 I didn’t think meringue could be very versatile, but I love how making the meringue into a roulade changes it. The thinness of the meringue makes it dreamy. Chewy in places, soft in others, and the creamy delicious Lemon flavours throughout, it is HEAVENLY. I was a little alarmed when I tried this recipe out, because I researched into the size tin to use, and mine was luckily correct. However, the meringue ballooned quiiiiite a lot when baking. However, THANKFULLY, it shrunk back down so I could roll it. The meringue naturally will crack when you roll it, and I think thats part of the charm of the dessert. Filling it with some of my Homemade Lemon Curd, some Passion Fruit, and the freshly whipped cream was so dreamy, so moreish. Roll the Roulade with confidence, you don’t want to panic as that might make it worse. I turn my Meringue out onto some parchment paper to make it easier, as meringue can stick quite easily. 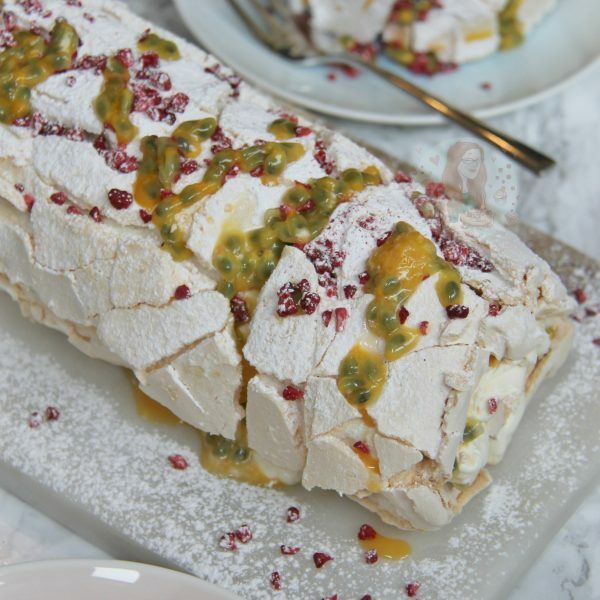 I dust the roulade with Icing Sugar to give it a little flare and make it pretty, and the Freeze Dried Raspberries just give it that extra oomph. Preheat your oven to 200C/180C Fan. Line a Swiss Roll tin with parchment paper – Mine was about 23cmx33cm. Whisk the egg whites with an stand mixer – I use my Kitchen Aid until they form stiff peaks – when you reach this stage, start adding the sugar 1tsp at a time. Once all of the sugar is incorporated it should be glossy, add in the lemon zest and keep whisking for a couple of minutes. 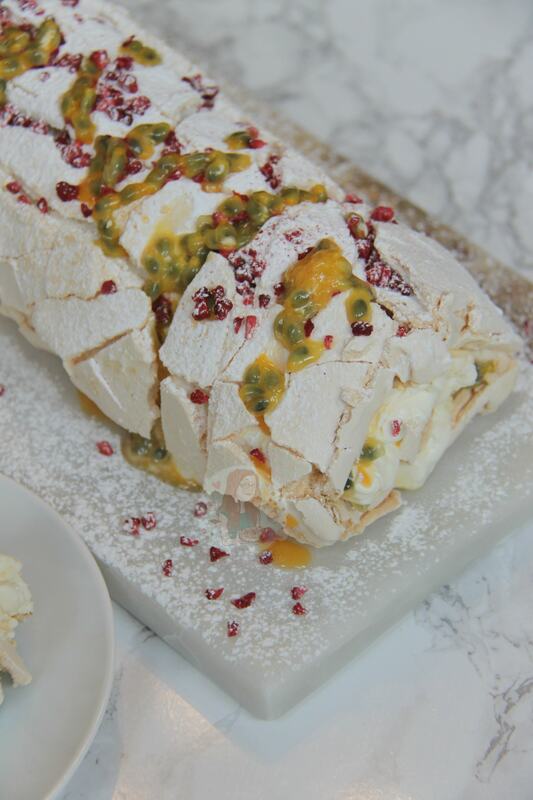 Spread the mixture onto the parchment within the swiss roll tin so that its as even and flat as you can get it – Bake the meringue in the oven for 10 minutes, and then lower the temperature of the oven to 180C/160C Fan and bake for another 20 minutes. Leave the Meringue to cool in the tin for about 15 minutes, and then turn it out onto a fresh bit of parchment (top of the meringue will be the side on the new parchment paper) and peel off the old bit of parchment and leave it to cool fully. Prepare your decoration/fruit – Whip together the cream and icing sugar until thick and whipped well. Spoon the insides of the passion fruit into a bowl! And loosen your Lemon Curd so its spreadable. Once the meringue is cool, spread the lemon curd over the meringue leaving an inch border of filling free meringue. On top of the lemon curd, spoon and spread 2 of the the passion fruit over the lemon curd. Finally, spread the cream over the mixture! From one long side, to the other, roll the meringue carefully so it forms the roulade. The meringue will naturally crack slightly, as its meringue. Sprinkle on some spare icing sugar, and sprinkle over some Freeze Dried Raspberries, and any spare passion fruit. Enjoy! I used my Homemade Lemon Curd when I used this recipe, and used about 300g of the curd. 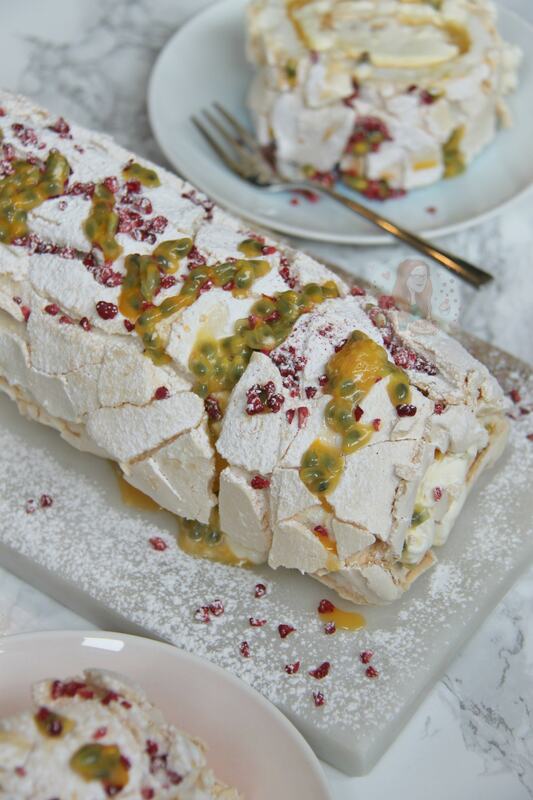 I used the Passion Fruit as I LOVE it combined with Lemon, and then them combined with cream and meringue – you can of course use whatever you like! The Icing Sugar in the Cream, and the Lemon Zest in the pavlova are optional, but I like my desserts sweet. This will last for two-three days once made, in the fridge. The longer you keep it, the softer it will get! Older Next post: Lemon and Raspberry Cupcakes! Newer Previous post: No-Bake Snickers Cheesecake! Hi Jane! Making this today, how long will it last and where/how is best to store it? Typically it lasts 2-3 days in the fridge, but it will get softer the longer its kept ?